This story was produced in partnership with the Florida Center for Investigative Reporting. An “elite” group of executives at U.S. Chamber of Commerce, the nation’s most powerful business lobby, will meet at a Trump hotel near Miami next year, according to the organization’s website. The conference for the Chamber of Commerce Committee of 100, an invitation-only group that serves as representatives of local chambers, will take place over three days in March 2018 at the Trump National Doral near Miami. The golf resort is managed by President Donald Trump’s son, Eric, and held in trust for the president, who has refused to divest from his business interests. As a 501(c)(6) trade association, the chamber is not required to publicly disclose its donors. Since Trump’s inauguration, the chamber has spent almost $40 million lobbying the administration, including the White House and the president’s top advisors. The chamber has made lowering the corporate tax rate a top priority. Last month, the organization announced it would evaluate 2018 congressional candidates on their role in passing tax reform legislation. The Trump administration is reportedly pushing to lower the corporate tax rate from 35 percent to 20 percent or 25 percent. Founded in 1912, the chamber is the world’s largest business league. The organization claims to represent more than 3 million businesses. The chamber itself is the largest lobbying group in the U.S. Since 2008, the chamber has spent almost $1 billion on lobbying — $650 million more than the second-highest spending organization, the National Association of Realtors. The chamber’s latest tax filings show membership fees accounted for roughly $7.6 million in funds, or almost 5 percent of its revenue that year. More than $131 million, or 75 percent, came from contributions of $100,000 or more. In 2015, individual companies — including American Express, Aetna, Chevron and Amazon — gave more than $8 million to the chamber, according to company disclosures compiled by the Center for Political Accountability. 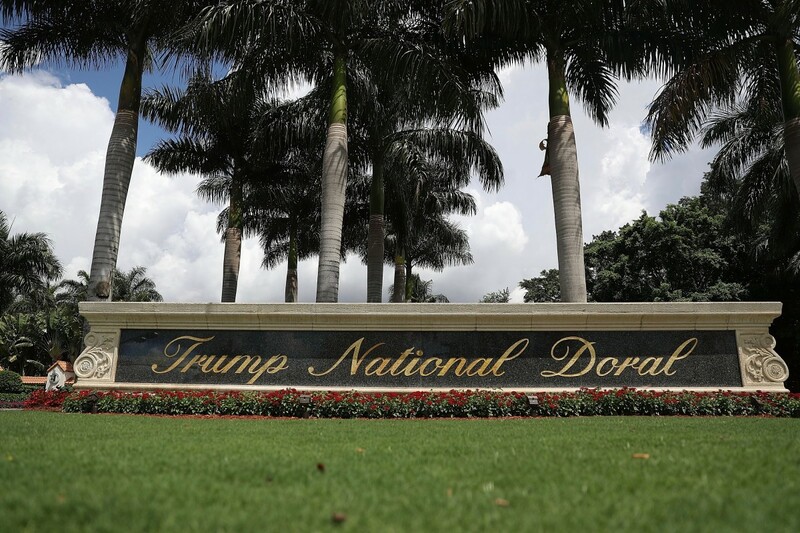 The Trump National Doral didn’t respond to questions about the costs of the chamber event. A similar, two-day Republican Governors Association event at the same property cost $409,588, according to filings by the association. The chamber’s spokesperson, Blair Latoff Holmes, said the meeting at a Trump property doesn’t represent a conflict of interest since the organization “rents space from all types of hotels and event spaces across the country for our various events.” And it won’t be the first time a chamber event has taken place at a Trump property. Shortly after Trump’s inauguration, the American Chamber of Commerce in Canada, a chamber affiliate, changed the venue for one of its events from the Vancouver home of a diplomatic official to a new Trump hotel. Other interest groups are making use of Trump real estate. The National Confectioners Association has booked three separate conferences at Trump properties for 2017 and 2018. So far this year, the Railroad Contractors Association, National Funeral Directors Association and Industrial Truck Association have hosted events at Trump properties. Trump, who campaigned on a promise to “drain the swamp” in Washington, has officially resigned from managing his businesses. However, the properties are still managed by his sons. They are being held in a revocable trust from which the president can withdraw money at any time, rather than a blind trust that totally insulates him from the Trump Organization’s activities.